During a field survey on 5/15/2010, land snail enthusiast Brian Marshall discovered a population of Daedalochila auriculata near Wills Branch (GPS: 30.17281N 081.45567W - WGS-84 Datum) adjacent to Ed White High School at 1700 Old Middleburg Road. During his visit Brian found 11 specimens of which two were alive. This reporter then visited the site the next day and found an additional 13 specimens of which three were alive. This reporter made a follow-up visit to the site on 10/22/2011 and a couple dozen additional specimens were found - only one of which was alive. 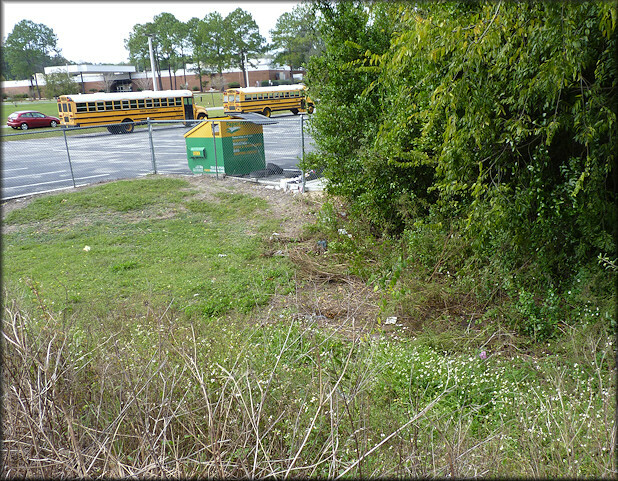 It was also determined that the overall habitat is much larger than initially suspected as specimens were now found on school property and in the roadside swale along Old Middleburg Road as well as other nearby areas to include immediately adjacent to a paved school bus parking area. Overall, the specimens found are smaller than those from other northeast Florida (Duval, Clay, St. Johns Counties) populations (see image).